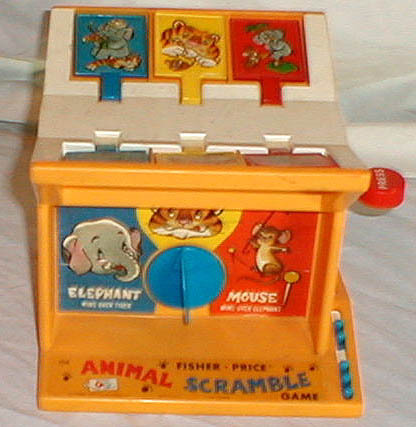 Description: The Animal Scramble Game is very unique, and even better, has no accessory pieces that can get lost. Each side of the game (below the flag) has a hidden selection button that allows child to select 1 of 3 animals (elephant on a blue background, tiger on a yellow background or mouse on a red background). When both children have made a selection, one child pushes a button on the side. This makes the winner's corresponding flag on top of the base pop up. If one child selects an elephant, and the other child selects a Tiger, the elephant wins, as an elephant sits on a tiger. The rules are...elephant sits on tiger.....tiger captures mouse......mouse frightens elephant. If both children select the same animal, then both flags pop up and it's a tie. 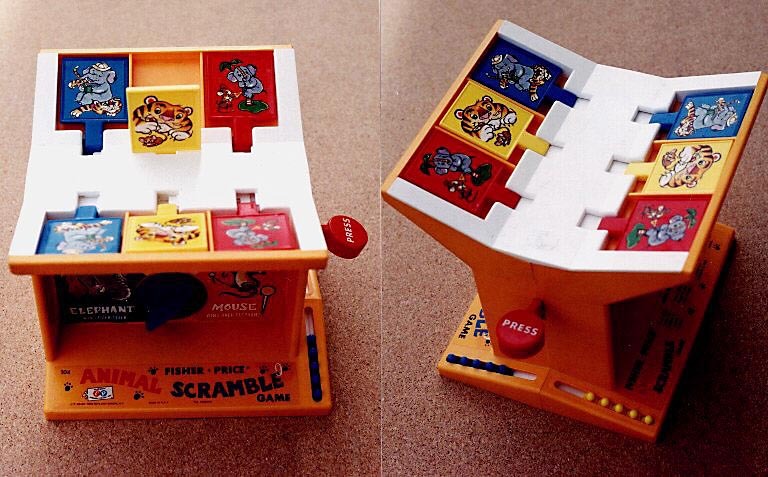 FPT45369 - Yellow plastic game that has a curved top with 6 flags that pop up, 3 on each side colored red, yellow, and blue (picture of an elephant on the blue flag, tiger on the yellow flag, and mouse on the red flag). Each side of the game (below the flag) has a hidden selection button that allows child to select 1 of the 3 animals. The red "PUSH" button on the side displays the game winner. The base measures 9" long, 8-1/4" wide and 7-1/2" high.